The fact is, dog treats can be expensive. Plus, the ingredients in them aren’t always best for your dog. As with human food, commercial dog treats can have preservatives, food coloring and other things that you may not want your dog to eat. Making your own homemade dog treats can be one of the best ways to not only be sure of what you are feeding your dog, but it can actually save you money too. What dog doesn’t love bones? This recipe is sure to please your dog since it has all kinds of goodies like ground beef, black beans, cottage cheese, and soy sauce to name a few. I have yet to meet a dog that does not love bacon-flavored goodies. 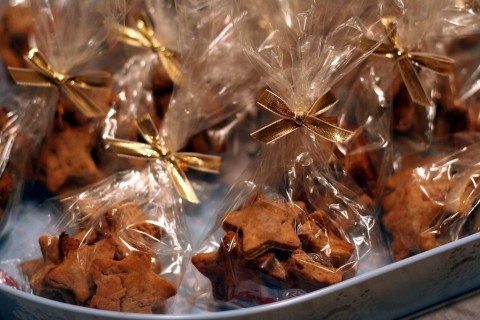 This bacon-flavored homemade dog treat recipe one is sure to become a fast favorite for your dog. This is a great treat if your dog is having a birthday or any other sort of celebration or party. With ingredients like fruit, oats, and cheddar cheese, your dog is really going to love these dog-friendly cupcakes. There are several vegetarian dog treat recipes here, including: pumpkin dog treat cookies, gingerbread dog treats, veggie bones, minty fresh herbal dog treats, and baggins biscuits to name a few. So, if you are a vegetarian and you want your dog to be too, this can be a great place to find veggie treats for your dog. Want a treat you can give your dog even if his tummy isn’t up to much else? This might also be a good recipe to try if your dog has been vomiting and has finally been vomit-free for several hours. With ingredients like hamburger, honey and rice, this could be just the type of bland food your dog needs. Of course it can also be a nice treat for him too even when he doesn’t have an upset tummy! Does your dog love fish? Is tuna one of his favorite foods? Well, then you might want to try Rachel Ray’s recipe for homemade tuna dog treats. My friend’s dog loved them! I used to have a dog that absolutely loved peanut butter. If I was eating a peanut butter and jelly sandwich or chocolate peanut butter cups, she would just be beside herself wanting a bite. I wish I’d known about this recipe back then because I think she would have been ecstatic to get these peanut butter bones! I didn’t even know there were such recipes… Soup for dogs? But what a nice treat this would make, especially on a cold winter day! Here, you’ll find recipes for dog dumplings, liver lover’s dog soup, and vegetarian chowder, to name a few. These recipes look almost good enough for humans! As you know, chocolate can be quite toxic for your dog. Chocolate can, in fact, make a dog very sick. However, not so with carob. So, if your dog loves chocolate (despite the fact that it makes him sick) this carob dog treat might be just the thing to make for him as a good substitute for chocolate. Got a dog that loves cheese? If so, then he’s sure to enjoy this treat which has cheddar cheese, oats, meat juices and other things that dogs love. These nuggets are another recipe I wish I’d known about for my peanut butter loving pooch, who also happened to love cheese! One thing to keep in mind is the fact that some dogs don’t have enough of the enzyme that breaks down lactose in their bodies. So, if your dog is lactose-intolerant, it’s best to use lactose-free milk products when making dog treats that call for cheese or other milk products. You don’t want your dog to get an upset tummy from a treat that you’ve made!